Guaranteed removal of unpleasant odors - fast! This unique and natural deodorizing formula absorbs and removed odors completely - it is not a cover up! Excellent as an all-purpose deodorizer. Safe for use as needed directly on your pet (including puppies and kittens), or pet affected areas such as carpeting, furniture, litter boxes and pet bedding. 17.5 ounce size. 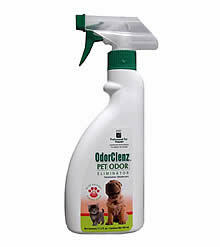 Relief from pet odors is just a spray away! Contains Natural Baking Soda and our patented OdorLock odor encapsulator to remove odors completely!